It is rare that you get to find freebies in New York City, but every once and a while, you can find something that lets you know you have found one of Manhattan's best-kept secrets. Bryant Park's ice skating rink sponsored by Bank of America is one of those hidden gems. If you bring your own ice skates, it is completely free. Located adjacent to the New York Public Library Main Branch, Bryant Park is transformed into the Winter Village. In addition to the 17,000-square-foot rink, there are rows of open-air stalls of holiday shops that makes Bryant Park a great destination for visitors to Manhattan for the holidays. 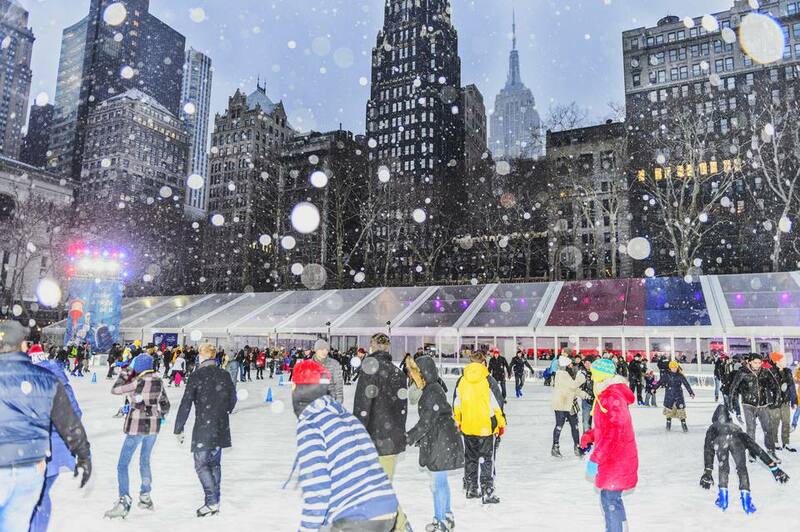 If you are looking for some ice skating options in midtown Manhattan, but want to avoid the lines and crowds at Rockefeller Center's Ice Rink, then ice skating in Bryant Park can be a good choice. Skaters get to enjoy one and a half hours on the ice—timed, in order to allow others an opportunity to have fun at the rink. Skating and lockers are free, but you will have to pay if you need to rent skates, want to check bags, or need to buy a lock for your locker. Children just learning to skate can get skating aids that function like walkers in the form of penguins on skis. Other skate store items include helmets for rent, socks to purchase, and skate sharpening services. If you are not skating, you can enjoy the holiday market or refuel with some refreshments and snacks at the adjacent eatery, holiday shops, or observation deck. If you want to learn to skate, private, semi-private and group lessons are available. The skating rink is busiest at the peak holiday season from November 20 to January 3. If you are planning to visit in that time period, arrive early in the day. Also, if you visit during this holiday season, skate rentals tend to be slightly higher in price. The rink is more likely to be busiest after school lets out at 3 p.m. and on weekends. You can purchase special tickets to reserve a time slot and also a VIP pass which gives you priority admission and priority at the skate counter. Of course, then, the experience is no longer free. You will need to keep your cell phones stowed while on the ice. Other items that are banned on the ice include headphones, cameras, backpacks, pocketbooks, food, and drinks. Children may not be carried, no more than two people can hold hands, and all children under 10 must be accompanied by an adult. Weather permitting, the rink opens is open daily from 8 a.m. - 10 p.m. This year, the rink opened Saturday, October 27, 2018, and will be open through March 3, 2019. Contact the rink regarding special holiday hours. Occasionally, the rink hosts free skating shows, special events, and activities. The Winter Village is located in Bryant Park from 40th to 42nd Streets between 5th and 6th Avenues. The nearest subways are the 7 or B/D/F/M trains to 42nd Street/Bryant Park stop.